Designed for forklift use to safely carry out tasks of short duration and occasional usage, such as maintenance or stocktake. 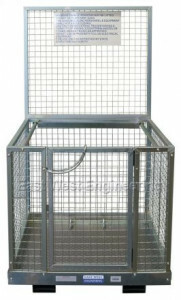 This safety cage is suitable for up to two people and is manufactured in accordance with Australian Standard AS 2359.1. Supplied standard as ‘flatpack’ (for on-site assembly) or may be supplied fully assembled upon request.